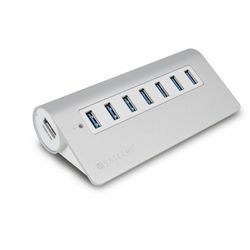 Don't just take advantage of USB 3.0's tremendous speed advantage over USB 2.0... take advantage of it in portable style with a sleek aluminum slanted hub with no less than 7 ports to employ. It features no frills but plenty of thrills with data transfer speeds up to 5Gbps. Also included is an AC adapter that provides up to 3 amps of power. Connect any USB device such as cameras, phones, external hard drives, flash drives, printers and more. The shiny design makes it the ideal companion for your Mac Pro®, iMac®, MacBook Air®, MacBook Pro® or Mac mini® computer. Includes AC adapter and USB 3.0 cable. Compatible with Mac OS 9.1+, Microsoft Windows 98SE+ and Linux 2.4+.